SAULA peat substrate for sowing is a neutralized peat-based product that contains everything necessary for plant germination and growth. The peat substrate is intended for olericulture, floriculture, forestry, sowing of seeds, vegetative plant propagation, and the cultivation of plants sensitive to salt concentrations. The Special substrate production technology ensures optimal plant nutrition and root development. The fertilizers and trace elements are selected so that the plants can easily absorb them. Tips: to achieve the best results, moisten the substrate thoroughly before use: it is advisable to do it in the evening before replanting. Cool weather is best for the replanting day. The substrate used is an ideal means for improving the soil in your fruit or vegetable garden. Component parts: peat moss (Sphagnum), H3-H7. Additives: limestone, fertilizer with trace elements, water absorption promotor. SAULA peat substrate for flowers is a neutralized peat-based product that contains everything necessary for plant growth and flowering. The peat substrate is intended for the growing and replanting of flowers and indoor plants. The special substrate production technology ensures optimal plant nutrition and root development. The fertilizers and trace elements are selected so that the plants can easily absorb them. Tips: to achieve the best results, moisten the substrate thoroughly before use. It is advisable to do it in the evening before the replanting day. Cool weather is the best for replanting. When planting or replanting houseplants, make a 2-3 cm drainage layer of expanded clay or pebbles at the bottom of the pot. Repot a plant into a larger container once a year. The used substrate is an ideal means for improving the soil in your fruit or vegetable garden. SAULA peat substrate for balcony flowers is a neutralized peat- based product that contains everything necessary for plant growth and flowering. It is especially suitable for potted plants with sensitive roots as well as for those that have grown in the same pot many years. Tips: to achieve the best results, moisten the substrate thoroughly before use. It is advisable to do it in the evening before replanting. Cool weather is the best for the replanting day. When planting or replanting houseplants, make a 2-3 cm drainage layer of expanded clay or pebbles at the bottom of the pot. Repot a plant into a larger container once a year. The used substrate is an ideal mean for improving the soil in your fruit or vegetable garden. 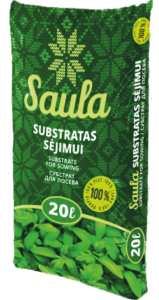 SAULA peat substrate for tomatoes and vegetables is a neutralized peat-based product that contains everything necessary for plant growth, flowering and fructification. The peat substrate is intended for seedling thinning, replanting and cultivating of tomatoes, peppers, eggplants, cucumbers, lettuce and other vegetables, as well as for supplementing and improving open and closed planting soil. The special substrate production technology ensures optimal plant nutrition and root development. The fertilizers and trace elements are selected so that the plants can easily assimilate them and provide a high yield. SAULA universal peat substrate is a neutralized peat-based product that contains everything necessary for plant growth. The peat substrate is intended for use in olericulture, floriculture, forestry, landscaping and for soil improvement. The special production technology of the substrate ensures optimal plant nutrition and root development. The fertilizers and trace elements are selected so that the plants can easily absorb them. Plants grow well in the substrate, so their yield is higher. Tips: to achieve the best results, moisten the substrate thoroughly before use: it is advisable to do it in the evening before the replanting day. Cool weather is best for replanting. When planting or replanting houseplants, make a 2-3 cm drainage layer of expanded clay or pebbles at the bottom of the pot. The substrate used is an ideal means for improving the soil in your fruit or vegetable garden. SAULA peat substrate for blueberries and rhododendrons is a natural peat-based product that contains everything necessary for plant growth, flowering and berry growing. The peat substrate is designed for planting, cultivation and maintenance of blueberries, cranberries, ornamental conifers, rhododendrons, azaleas, heather and other plants that love acidic growing mediums. The peat used to produce the substrate is sterile and features high porosity, which ensures better water absorption and moisture retention. The special substrate production technology ensures optimal plant nutrition and root development. The fertilizers and trace elements are selected so that the plants can easily absorb them. Component parts: peat moss (Sphagnum), H3-H7. Additives: fertilizer with trace elements, water absorption promotor.